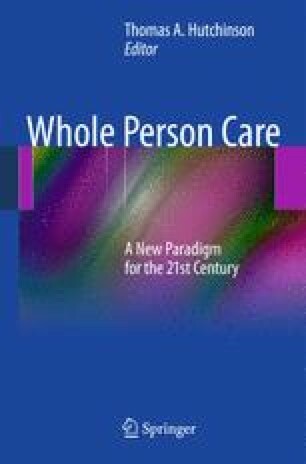 Is whole person care a clear solution to problems plaguing twenty-first century medicine, including the paradox that we have more security, health, and material comfort, and live longer than humans at any other time in history, and at the same time appear to be more unhappy, anxious, and dissatisfied than ever before? We believe that mindful whole person care is a solution to the problem of unhappy patients who increasingly complain about the care they are receiving and to healthcare workers who are increasingly stressed out and burned out on the job , despite greater technological ability to solve medical problems than has ever been available to mankind. The solution that we are suggesting is not window dressing or simply better manners, but a change in the patient–healthcare worker relationship that takes lessons from the palliative care movement and applies them in a much wider context. But make no mistake, whole person care is not palliative care by another name, but a new paradigm for practicing medicine that is relevant to all parts and specialties of medical practice. National Cancer Institute. U.S. National Institutes of Health. Estimated U.S. Cancer Prevalence [Internet]. Rockville, MD. 2010. http://cancercontrol.cancer.gov/ocs/prevalence/prevalence.html#survivor. Rieff D. The way we live now. Miracle workers? [Internet]. New York Times. 17 Feb 2008. http://www.nytimes.com/2008/02/17/magazine/17wwln-lede-t.html?_r=&ei=51241&en=12388136d24f.